PRINCE2 (Projects IN Controlled Environment) is a structured method for the effective and efficient management of projects. It is a generic, best-practice approach for the management of all types of projects and it has become the de facto standard for organising, managing and controlling projects globally. Project managers: anyone who is applying PRINCE2 at work would benefit from having a clear and graphic overview of the method. Course delegates: QRP International provides an A3 Process Map version as part of the training material during our courses, both classroom and distance learning. PRINCE2 is firmly established as the world’s most practiced method for project management and is globally recognized for delivering successful projects. In July 2017 AXELOS released the first major update to PRINCE2 since 2009, with the 2017 version of the method: this brings along a new PRINCE2 guidance and new Foundation and Practitioner examinations. The purpose of the updated version is to better respond to current imperatives for flexibility and agility, and the new guidance wants to do so with a renewed focus on the importance of tailoring. The PRINCE2 Process Flow Diagram is a graphical ‘at a glance’ representation of all the PRINCE2 processes and how they fit together and it shows all the processes involved in running a PRINCE2 project from start to finish. The QRP International’s PRIN​CE2 Process map does not show only all the processes and how each stage integrates with the others but also what action needs to be taken for each process, which are the important products, documents or information to deliver during the stage​ for each management level​​ (Team Manager, Project Manager, Project Board). Looks complicated but it’s not! This process map is a strong asset during your PRINCE2 Foundation and Practitioner course and an helpful reference ​once back in the office​ as a project manager. 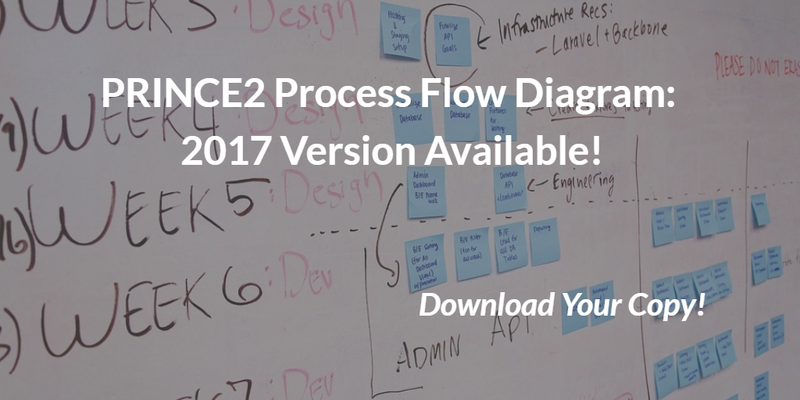 Our PRINCE2 Process Map is available for download: don’t miss this chance! QRP International has a full selection of recommended reading for professional qualifications: check out our Literature page to stay up to date with the latest publications on Project, Programme, Portfolio and Change Management. Furthermore, our commitment is to share with the community practical cases and real life scenarios about the methods, as well as white papers that illustrate the features of each Best Practice: check out our Articles & Case Studies page to find valuable content, easy to download!